Stephen King once called H.P. Lovecraft "the twentieth century's greatest practitioner of the classic horror tale." This seems like a fair descriptor, seeing as how the man pretty much created the Cosmic Horror genre. Lovecraft's stories have been inspiring horror artists for the better part of a century, but a recent challenge to art students has resulted in what is quite possibly one of the best collections based on the man's writings. Create a creature based upon a non-humanoid critter from H.P. Lovecraft's literature. The creature should have a fully resolved form, convey motion where appropriate, and be believable. Creature can be shown as either 3/4 view or 'turn-arounds'. Schindehette has now posted some truly fantastic results on his blog, complete with commentary from various art directors and illustrators who specialize in this style of work. 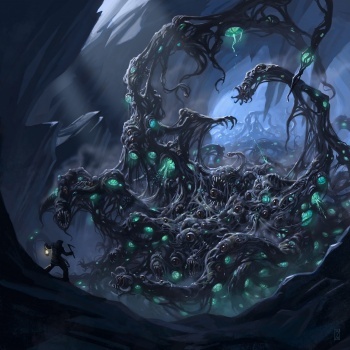 The image on display here is Craig J Spearing's "Shoggoth", and I highlight recommend heading over to the blog itself and checking out the whole selection on display.